The world's largest drive-in restaurant. An Atlanta treasure, since 1928. 2500 pounds of potatoes, 5000 fried pies, and 300 gallons of chili are made from scratch daily. Menu: Chili dog, cheese dog, slaw dog, chili slaw dog, chili cheese dog, chili cheese slaw dog, naked dog. Hamburger, BLT, grilled cheese, pimento cheese, chicken salad, grilled chicken sandwich, chicken nuggets. Lettuce, tomato, onions, slaw, chips, bacon. Garden salad, grilled chicken salad. French fries, chili cheese fries, onion rings (best rings on the planet). Fried apple pie, peach pie, ice cream, pie ala mode, brownie, icee. Sodas, sweet tea, coffee, milk, hot chocolate, chocolate shake and the famous... frosted orange. My favorite order... Cheese dog with onions, rings, peach pie or frosted orange. OMG! 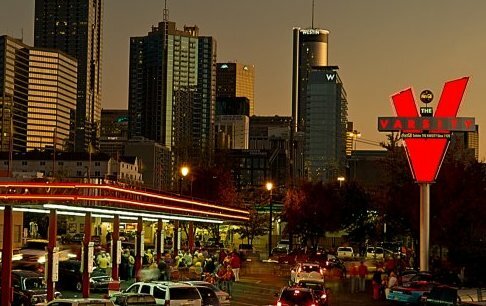 Along with the famous drive-in or dine-in downtown restaurant (complete with old fashioned Car Hops), we also have 6 "Varsity, JR" locations throughout Georgia (drive-through and/or dine-in only). Atlanta Hartsfield Jackson Airport (opened in 2012), Alpharetta, Athens, Dawsonville, Kennesaw, and Norcross. The Varsity (downtown Atlanta) is an easy stop for drivers traveling south through Atlanta, on I-75. I recommend dining in for the full experience. We take the family at least once a year.